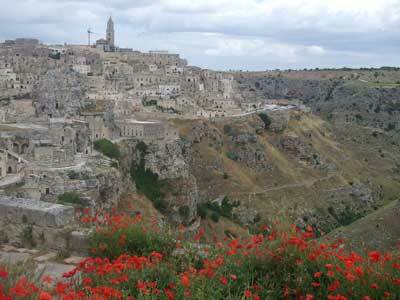 Matera is one of the most interesting, unusual and memorable tourist destinations in Italy. In the remote southern region of Basilicata (also called Lucania), still little-visited by foreign travellers, it is a town famous for its extensive cave-dwelling districts, the sassi. Curious visitors can stay in caves, wander the lanes alongside the picturesque cave-filled cliffs, and learn the history of this fascinating place. The caves of Matera had been inhabited for centuries; some humble and some smarter residences, but by the early twentieth-century the area was a by-word for poverty. Until the 1950s hundreds of families were still living crowded into cave-houses here. The squalor and malaria-ridden conditions became a national scandal and finally the cave residents were moved - by law - to modern buildings on the plateau above. By the 1980s the abandoned caves of Matera were no longer scandalous, but fascinating reminders of the past. A few rather more well-to-do residents moved back and renovated old cave houses. In 1993 the town was made a UNESCO World Heritage site, for being "the most outstanding, intact example of a troglodyte settlement in the Mediterranean region, perfectly adapted to its terrain and ecosystem". 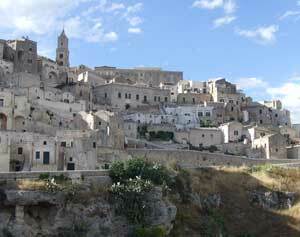 And ever since, Matera has become steadily more popular as an off-the-beaten-track tourist destination. More and more old cave-houses are being converted into comfortable modern dwellings, into hotels, B&Bs and restaurants. You can take guided tours of the sassi and visit historic reconstructions of cave life. Matera was the one of the filming locations for Mel Gibson's film The Passion of the Christ, with shots showing the sassi and the gorge below. The way to start your visit to Matera is to wander around the sassi districts, looking at the cramped town above its ravine, and the tumbling grey stone facades, which appear to be houses but turn out to be caves. If you are just passing through, with only a casual interest, this plus a visit to a reconstructed cave-dwelling will suffice for a taste of the town. But to make the most of a trip to Matera, and to understand what you're seeing, it really helps to have some context. After an initial independent exploration, we'd suggest taking a guided tour, reading a guidebook, visiting a cave-life reconstruction and one of the local museums. To 'see' Matera thoroughly, and to get an idea of the living conditions for the former cave-dwellers, you should spend at least a day in the town. For those who want to absorb more of the history and unique atmosphere, to explore the quieter spots and visit museums and churches, we'd recommend staying at least two nights in Matera. It can be hard to get one's bearings in Matera. The town centre, the oldest part of town, was built on the edge of a bare plateau where a high rocky mount looms over the spot where a valley descends to the long deep river-ravine. This is where you'll now find the town cathedral and the fairly typical Italian town centre. As time passed, the rocky valley slopes below the town were dug out to create caves, used for housing, storage and stabling. These cave areas, where the poorest local peasants lived, fill a narrow valley and run along the side of the gorge itself. The first, and smarter, of the cave districts is called the Sasso Barisano and the other the Sasso Caveoso. Small lanes, alleys and stairways wind through the districts, some still closed off and abandoned. At first glance, the slopes might seem lined merely with small shabby stone buildings. But behind the simple facades - which sometimes extend outwards like traditional houses - the dwellings go back into the rock, cut out usually to form one large room, with a kind of ante-chamber at the back for animals. These parts of Matera are strange, quiet and picturesque; the pale rock makes the scene seem faded, colourless and timeless. Overhead swoop birds of prey which have made homes among the silent sassi including the Lesser Kestrel (Falco naumanni). In Matera and throughout this part of southern Italy, there are many churches cut into the rock of hillsides and ravines. These rock, or rupestrian churches - chiese rupestri - were mostly created by Basilian monks who were fleeing the iconoclastic persecutions in the Byzantine Empire during the eighth and ninth centuries. The caves often contain faded frescoes in the Byzantine style. Many in Matera are kept locked, but some can be opened by tour guides, and several are open to the public with a combined ticket organised by the Circuito urbano delle Chiese Rupestri. It is well worth visiting one or two of these atmospheric ancient places of worship. One of the nicest churches in Matera, though, is actually not a rock church. San Pietro Caveoso is built in a picturesque spot on a rocky spur above the ravine, and is a charming small building with a welcoming atmosphere, simple folk-art decorations and some friendly saints. Up in the crags above are two of the chiese rupestri, Madonna dell'Idris and San Giovanni in Monterrone, connected by a tunnel and visited with the combined ticket. They are good ones to visit, for as well as the truly cave-like feel, burrowed into a little rocky summit, there are some charming Byzantine-style wall-paintings. The town's main historical museum, the Museo Nazionale Ridola, contains exhibits from distant eras of Basilicata's past, from prehistory to the Roman age (closed Monday mornings; a small entrance charge). Nearby, Palazzo Lanfranchi houses the Museo Nazionale d'Arte Medievale e Moderna della Regione Basilicata - an art museum incorporating the Pinacoteca D'Errico, which has lots of religous paintings by southern painters and, more interestingly, the Centro Carlo Levi, which contains a range of paintings by the twentieth-century artist and writer who is a part of this region's modern history (see Basilicata page for more about Carlo Levi). More recent artwork can be seen in the well-presented sculpture gallery MUSMA (Museo della Scultura Contemporanea Matera), which exhibits sculpture from the nineteenth century onwards (closed Mondays; winter afternoons). It's normal for churches and attractions to close for a few hours in the middle of the day, and winter opening hours are generally reduced, so check the latest times on the websites (see right) or on your arrival in Matera. As tourism in Matera is becoming big business, various enterprising locals have set up tourist attractions such as cave 'reconstructions': cave-houses which have been filled with period fittings to show how life was once lived here. 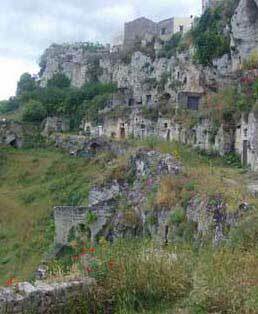 These include the Casa Grotta di Vico Solitario, well-signposted in the Sasso Caveoso area. You are ushered into the cave, and left to look around while listening to a recorded commentary in your chosen language. 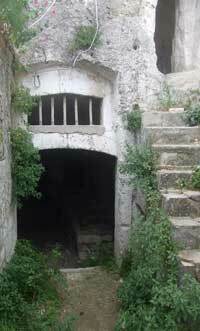 There is another similar cave in the Sasso Barisano area, the Casa Grotta del Barisano. These are fascinating opportunities to see the typical layout of an inhabited cave, as they would have been until being deserted in the 1950s. The furnishings and design are all very standard, and it is both impressive to see how families adapted to these restrictive living conditions, and shocking to think how recently people lived like this. Chickens were kept under the bed, a horse in the corner and children slept where they could. Matera's biggest festival is the Festa della Bruna on the 2nd July each year, involving processions, costumes and fireworks. There are various organisations operating tours of the sassi, and you may also encounter individual guides loitering around touting for custom. A company called Sassi Tourism have an office on the main panoramic road, and run quite frequent tours in English. They also sell the combined tickets for cave-churches, if you want to explore on your own. Once you've arrived in Matera, read a guidebook and got a feel for the town, you will probably be able to decide for yourself if you'd rather discover the sassi independently - which is perfectly possible and safe - or if you prefer to take a guided tour. 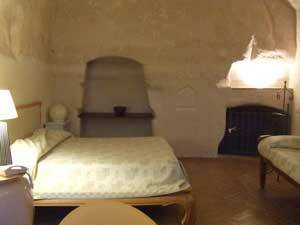 Our top tip is to stay in a cave while you're in Matera. There are several hotels and B&Bs where this is possible - see below for recommendations. Visiting a casa grotta reconstruction will bring home to you the difference between your nice hotel cave and the caves as inhabited by large families sixty years ago. A bit of historical background really helps to make sense of the sights of Matera. Guidebooks or tour guides can be helpful to provide context. As well as the offical tour guides, you may encounter other residents keen to impart their knowledge, including the loitering guides mentioned above. We got trapped in a church by a man who, unasked, reeled off a string of dull information then asked for money. Accept offers if you wish; don't be afraid to say no and don't pay more than you feel is just. We gave the church bore a small token amount, and shortly afterwards we met very different local who shared huge amounts of information and reminiscences with us out of sheer friendliness and local pride. So don't feel inhibited about asking questions of local people; most residents over a certain age will remember the inhabited sassi, and if they didn't live there themselves, will know those who did - and also know of their nostalgia for their harsh but unusual cave upbringings. Asking about the town and its citizens may invite anecdotes which will bring your holiday to life. One of the most important things to consider when planning your trip to Matera is timing. Some churches and attractions are only open at weekends, particularly in winter, and some require advance booking. If you want to fit a lot into your days, note that most sites with opening hours will close for up to four hours in the early afternoon. Travelling on a Sunday or a bank holiday is to be avoided if you don't have a hire car - there are no trains on these days, and limited bus services. As Matera becomes more visited by tourists, some of these restrictions might lift - but by that time the atmosphere may also have lessened... so our advice is to visit soon, and plan around these inconveniences. There are already quite a few tour groups looking around town; late afternoon is a good time to avoid them. The easiest way to reach Matera from the UK is to fly to Bari Airport, around 40 miles away. Bari Airport (also called Bari Palese) is, at the time of writing, served by budget Ryanair flights from London Stansted. There is a private railway line connecting Bari with Matera (more below) and in the summer months, there is currently a free bus service, called Pugliairbus, from Bari Airport to Matera, running several times a day (not Sundays) - book online in advance via the links on the airport webpage (see links panel on the right). To use year-round public transport, begin by taking a bus from the airport to Piazza Aldo Moro, outside Bari Centrale railway station. The Bari - Matera railway line is run by the Ferrovie Appulo Lucane. Tickets are very cheap and the scenic journey takes around an hour and a half. There are no services on Sundays or Italian public holidays, so plan carefully. The terminus in Bari is alongside the main railway station in Piazza Aldo Moro. There's a little ticket office on the ground floor and trains depart from a platform upstairs, where there is a small waiting area. Stamp your tickets in one of the machines provided before you board the train. In Matera there are three stations. Tourists will generally want the middle station, called Matera Centrale, which is in a dank underground tunnel, with a ticket office above at ground level. It will be helpful to look at a map, or to obtain directions from your hotel, before arriving in town, since orientation can be tricky. Matera Centrale station is in the newer part of town, above the sassi. When you emerge in the open air, cross over the Piazza Matteotti, and head downhill along Via Roma. There is a tourist information office (APT) on the left. At the bottom of the road you come to Piazza Vittorio Veneto. This is the town's social hub, and it is just above one of the main cave-dwelling areas, the Sasso Barisano (down a flight of steps). To explore the sassi, just head downhill from here. Otherwise follow the directions from your hotel. Matera is also served by buses, although the lines don't run very frequently and you should check timetables in advance. SITA operate bus services from Matera to Taranto and Metaponto, both of which are on the mainline FS rail network, and to other local towns and villages. There is a nearer FS station at Ferrandina, but without (currently) a reliable connecting bus service. A company called Marozzi run buses to Rome. If you are just visiting Matera, or are combining it with neighbouring Puglia, public transport is a feasible option. However, for exploring at your leisure, and seeing more of the remote Basilicata region, a hire car will be extremely useful. Car access to the centre of Matera is limited, and drivers should check in advance with their hotels for parking advice. Outside Matera is an archaeological park covering an area of rock churches. The Parco Archeologico Storico Naturale delle Chiese Rupestri del Materano (more simply the Parco della Murgia Materana), can be explored with guides. A list of guides, with their email addresses and languages spoken, is published on the park's website along with official prices (from €60 for a half-day with up to 4 people). 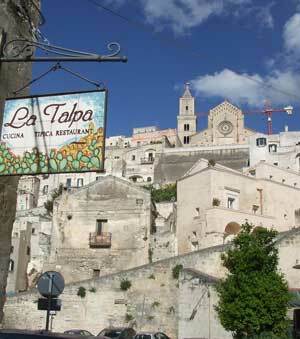 We combined Matera with a tour of the neighbouring region of Puglia. This works well thanks to the train service between Matera and Bari (see above). Otherwise, public transport from Matera is limited. For up to three nights, you'd find enough to do in Matera, perhaps adding a visit to nearby Altamura (on the railway line). For a longer stay, and if you want to explore more of the Basilicata region, a car will be extremely useful. If you are visiting away from the heat of summer, it is possible to enjoy some hiking around this area, to explore more rupestrian churches, and tour picturesque villages. Down on the coast, between Italy's toe and heel, is Metaponto, where you can visit the ruins of the Greek city of Metapontum. If you have become fascinated by Carlo Levi's accounts of the peasant culture which endured into the twentieth century, you could take a trip to Aliano, the village of his exile (called Gagliano in his writings), 55 miles from Matera. In Aliano there is now a literary park dedicated to Levi, and visitors can also see an exhibition of his paintings, a museum and the writer's grave. The best way to visit Matera is to stay in a cave. In the last few years, as the town has became an established tourist destination, several new hotels and B&Bs have been created within the sassi. I've stayed in two very good hotels: the affordable three-star Locanda di San Martino and the four-star Hotel Sant'Angelo, which house guests in a network of renovated cave-dwellings. The best guidebook is probably the Lonely Planet guide to Puglia and Basilicata . It covers the two neighbouring regions of Puglia and Basilicata, which combine well for a touring holiday. The information is pretty thorough and well-researched, and although it does have its minor faults, the guidebook is a useful companion for exploring this lesser-known area of Italy. It has eight pages on Matera including a small town map.